2014 is going to be my year of travel and life experiences. A benefit of getting older are little pockets of wisdom and realizations that you pick up along the way and one of the many things I picked up is recognizing the fact that experiences are what turns a person's life from average to something outstanding and definitely well-lived. I wanna take life and squeeze it for everything it's worth. What better way to kick it off than at the most legend (wait for it :P) -dary music festival of 2014... 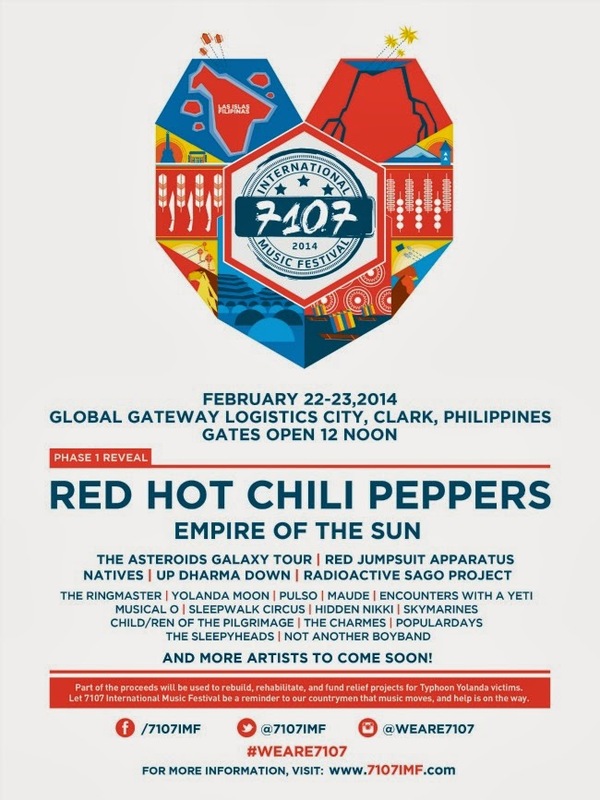 The 7107 International Music Festival! This is my chance to experience something Coachella-like without having to dish out a huge portion of my savings. But most importantly, it also helps me cross another item off my bucket list....watching the Chili Peppers live. I grew up with their music and it has been my life's mission to see Anthony Keidis and Flea perform their magic together on stage, watching them will almost complete my list of 90s bands to watch. I'm also looking forward to Empire Of The Sun. If the Peppers contributed much to my teen soundtrack, Empire's songs basically make up the entirety of my summer soundtrack. I have built numerous, awesome memories with both of their music in the background. It's already sounding totally epic but that's just phase 1 of the line-up. Gah, can't wait to see the final list. I've heard tons of rumors about Snoop Dogg, Drake, Pearl Jam and even Kanye coming over...I hope they prove to be true but even if it doesn't, 8K/20K is already a small price to pay for a 2-day event with such high profile bands performing. I can hardly contain my excitement! I am 101% sure this is going to be priceless. Having said that, I'll leave you with these 2 videos and an invitation to be part of history with me! ps. Gather 5 of your friends and book your tickets together to avail of a 15% discount. Just use the promo code: "group7107"